To Cite: Rahimi P, Roohandeh A, Sohrabi A, Mostafavi E, Bahram Ali G. Impact of Human Enterovirus 71 Genotypes in Meningoencephalitis in Iran, Jundishapur J Microbiol. 2015 ; 8(12):e27113. doi: 10.5812/jjm.27113. Background: Since the importance of poliovirus has diminished, as a result of its elimination in the majority of countries, non-polioviruses are emerging as causative agents of severe central nervous system (CNS) involvement. Outbreaks of enterovirus 71 (EV71)-associated CNS infections have recently been reported in Asia, Australia, and Europe. Objectives: This is the first study on genotyping of EV71 in children with meningoencephalitis to be carried out in Iran, and it was conducted in order to obtain an improved understanding of the disease burden of this virus, particularly with regard to CNS involvement. Patients and Methods: Viral RNA was extracted from 170 cerebrospinal fluid samples obtained from children aged under 8 years with a primary diagnosis of aseptic meningitis. Specific EV71 PCR was conducted to identify the genotype of the detected EV71 viruses. Results: Human enteroviruses (HEVs) were detected in 89 patients (52.3%). EV71 infection was detected in 19 (21.3%) of the 89 EV71-positive patients, and the C genotype was identified in 15 isolates. Conclusions: The C genotype should be considered as the prevalent EV71 circulating genotype in Iran, particularly in cases of aseptic meningitis. Poliovirus is gradually diminishing in importance, as a result of the elimination of its wild-type in the majority of countries (1-5). Although herpes simplex virus (HSV) types 1 and 2, as well as HSV 6, are well-known in viral meningitis, the emergence of enterovirus 71 (EV71) as a viral cause of neurological diseases, such as encephalitis and hand-foot and mouth disease (HFMD) in Eastern Europe, Malaysia, Taiwan, Japan, Australia, and Singapore, has drawn attention to non-polio enteroviruses (2-15). It is known that EVs are the major cause of aseptic meningitis (13-15), and have been detected at rates of 46.2 and 52.63% in various studies of children with viral meningitis in Iran (15-20). However, there are no available data regarding the role of EV71 in aseptic meningitis, and its circulating genotype(s) in that country. We conducted this study to assess the distribution of the different genotype(s) of EV71 infection in aseptic meningitis and encephalitis for the first time in young children in Iran. Between 2009 and 2011, 170 children aged under 8 years were admitted to the children’s hospitals in Tehran, Iran, with a primary diagnosis of viral meningitis, based on clinical symptoms and laboratory results, such as the sudden onset of fever, headache, a stiff neck, and other signs of meningeal inflammation, a normal glucose concentration in cerebrospinal fluid (CSF), a white blood cell count of greater than 20 cells/mL (mostly mild lymphocytic pleocytosis), a negative CSF culture for bacteria (e.g. tuberculosis), and fungi and tumor etiology. None of the children was immunocompromised, and there was no history of HFMD. Children who had received antibiotics prior to CSF examination were excluded. The informed consent form was signed by the children’s parents or guardians, and this study was approved by the ethical committee of the Pasteur institute of Iran. CSF samples were collected by the physicians and transferred on ice to the department of virology, Pasteur institute of Iran, and stored at −80°C for further processing. Viral RNA was extracted using the high pure viral nucleic acid kit (Roche diagnostics GmbH, Mannheim, Germany), according to the manufacturer’s instructions. cDNA synthesis and detection of human enteroviruses (HEVs) was performed as previously described (15-18). To avoid any probable contamination, each PCR positive sample was separately amplified using specific primers targeting the VP1/VP3 junction region (19, 20). Touch down PCR was carried out in a 25 μL reaction mixture consisting of 2.5 μL 10x PCR buffer (Fermentas Thermo Scientific, Lithuania), 0.75 μL MgCl2 50 mM (Fermentas, Thermo Scientific, Lithuania), 0.5 μL 10 mM dNTPs (Fermentas, Thermo Scientific, Lithuania), 0.5 μL of 0.04 μmol forward primer, 5'-GCA GCC CAA AAG AAC TTC AC-3', 0.5 μL 0.04 μmol of reverse primer, 5'-ATT TCA GCA GCT TGG AGT GC-3', 0.5 μL Taq DNA polymerase 100 U (Fermentas, Thermo Scientific, Lithuania), 1 μL DMSO, and 2 μL of the EV-positive cDNA (18, 19). The amplification reactions were as follows: initial denaturation at 95°C for 5 minutes, followed by 15 cycles comprising denaturation at 95°C for 35 seconds, annealing at 50°C for 16 seconds, and extension at 72°C for 35 seconds, followed by 40 cycles consisting of denaturation at 95°C for 35 seconds, annealing at 48°C for 16 seconds, and extension at 72°C for 35 seconds, and final extension at 72°C for 10 minutes. The PCR product underwent electrophoresis on a 1.5 % agarose gel containing 0.5 μg/mL ethidium bromide (Cina Gen, Iran) using a 50-bp DNA ladder as a molecular marker to detect a product size of 226bp. Diethylpyrocarbonate water and the EV71, which was kindly provided by Dr. Qibin Leng, were used as negative and positive controls, respectively. The product was purified using a QIAquich gel extraction kit (Qiagen, Inc. GmbH Hilden, Germany) according to the manufacturer’s instructions. It was then sent to a dealer company in Iran, which sent it on to a laboratory in South Korea for sequencing in both directions using a BigDye terminator cycle sequencing kit (Perkin Elmer-Applied Biosystems, Inc. CA), and specific primers on an ABI Prism 3730/3100 DNA analyzer ( Perkin Elmer-Applied Biosystems, Inc.). The sequence data were analyzed using BioEdit software (version 7.0.5). Phylogenic analysis was conducted using the molecular evolutionary genetics analysis software package, version 5.0, and the neighbor-joining method with 1000 bootstrap repetitions (Figure 1). The polio virus type 1 was used as an out-group. The tree was elaborated by the neighbor-joining method using molecular evolutionary genetics analysis 4, and the bootstrap (1,000 replicates) supporting each node is indicated. The scale bar corresponds to 0.1 substitutions/site references and GenBank accession numbers for the sequences used in VP1 comparisons were as follows: EV71B4: gi [AF376067.1] (Australia), EV71B3: gi [AF376117.1] (Australia), EV71B2: gi [AF009530.1] (USA), EV71B1: gi [AF135886.1] (USA), EV71A: gi [AB204852.1] (Japan), EV71A: gi [AB204853.1] (Japan), EV71C3: gi [DQ341356.1] (Malaysia), EV71C1: gi [AF376098.1] (Australia), EV71C1: gi [AF376080.1] (Australia), EV71C4: gi [FJ606447.1] (China), EV71C4: gi [FJ606448.1] (China), EV71C4: gi [FJ606450.1] (China), EV71C4: gi [HQ129932.1] (China), EV71C4: gi [AF302996.1] (China), EV71C4: gi [HQ188292.1] (China). The types of EV 71 analyzed in this study are indicated by diamond with their genotypes. These EV71 sequences have been deposited in the GenBank database under GenBank accession numbers: gi/JX495150/EV71, to gi/JX495164/EV71. Statistical analysis was carried out using the chi-square test, with statistical package for the social sciences software, version 19.0. P < 0.05 was considered as the level of statistical significance. In total, there were 117 males and 53 females. HEVs-specific primers (5'-UTR) allowed the identification of EV infection in 89 (52.3%) of 170 patients with 38.8% being males and 13.5% being females. EV71 infection was detected in 19 (21.3%) of the 89 EV-positive patients, with 15 being males and four being females. HEV and EV71 infection were both primarily identified in children of 0 - 2 years old (38.2% and 13.5% respectively), with no significant difference between the age groups. EV71 infection was detected throughout the entire duration of this study. Although the difference in infection rate was not significant, it was at its highest during fall and at its lowest in spring. The genotype of 15 specimens was successfully identified as being genotype C (four specimens were inadequate following the first step) (Figure 1). Following eradication of the poliovirus, EV71, which frequently causes aseptic meningitis, is considered to be the most dangerous EV (14, 21-24). Features of HFMD are also usually present, but, in a small proportion of affected individuals, neurological complications are the only presentation (23-26). Epidemiological data have shown that males have greater exposure than females to EVs infection (5, 7, 10, 11, 14-25). HEVs-specific primers (5'-UTR) allowed identification of EV in 89 of 170 patients (52.3%), with 38.8% being males and 13.5% being females, and EV71 infection was detected in 19 of the 89 HEV-positive patients (21.3%), with 15 being male and four being female. The prevalence of EV71 infection did not differ significantly between genders (P = 0.591). EV71 infection was primarily identified in children aged under 2 years (13.5%), with no significant difference observed between age groups. Previous studies have suggested that the far higher population densities in Asia result in a lower average age at infection and more severe symptoms than observed in older European countries, that our results are in agreement with these findings (27-31). Several outbreaks of EV71-related HFMD and CNS involvement have been reported, primarily from Asia (20, 24, 25, 29-33). EV71 infection results in HFMD, with or without neurological manifestations, due to different genotypes of EV71 (20, 24, 28-35). However, further studies are needed to support this hypothesis. EV71 is classified into three genotypes, A, B, and C, based on molecular analysis using VP1 and/or VP4 gene sequences, with further sub-genotypes, B1-B5 and C1-C5, being present within the B and C genotypes (20, 23, 26, 27). In the present study, the genotype of 15 specimens was successfully identified as being genotype C (four specimens were inadequate following the first step) (Figure 1), and polio virus type 1 was used as an out-group for analysis of the VP1 sequence data. It has recently been proposed that sub-genotype C4 strains represent the new genotype D (26, 27). In addition, a novel sub- genotype, B0, which was circulating in the Netherlands from 1963 to 1967, has been proposed (25). The VP1 protein contains numerous neutralization sites and corresponds to the virus serotyping; therefore, it was from this that most of the EV71 phylogenies were derived (15-17, 31, 36). It might be possible that two sub-genotypes, B3 and C4, are recombinants of EV-71 and prototype CV-A16/G10 (27, 31, 36, 37). In one study, which considered EV71 isolates from Singapore, Sarawak (Malaysian Borneo), and Perth, Western Australia from 1997 - 2001, it was determined that these recent strains were from genogroups B and C (25, 28, 29, 31-33, 35, 36). In the present study, only genotype C was identified in 15 specimens, perhaps because of the degradation of the viral genome, due to the presence of RNases in clinical specimens, or a low viral load (15-17). This type has previously been identified in many cases of CNS involvement (31, 32, 38). In 2004 in Austria, EV71 C4 was detected in two patients with severe aseptic meningitis that was not associated with HFMD (14). In contrast, HFMD was associated with an outbreak of the disease in China (14, 18, 20, 27, 31-33). The C1 genotype was also isolated from children with aseptic meningitis without HFMD in Norway (14, 31, 39, 40). 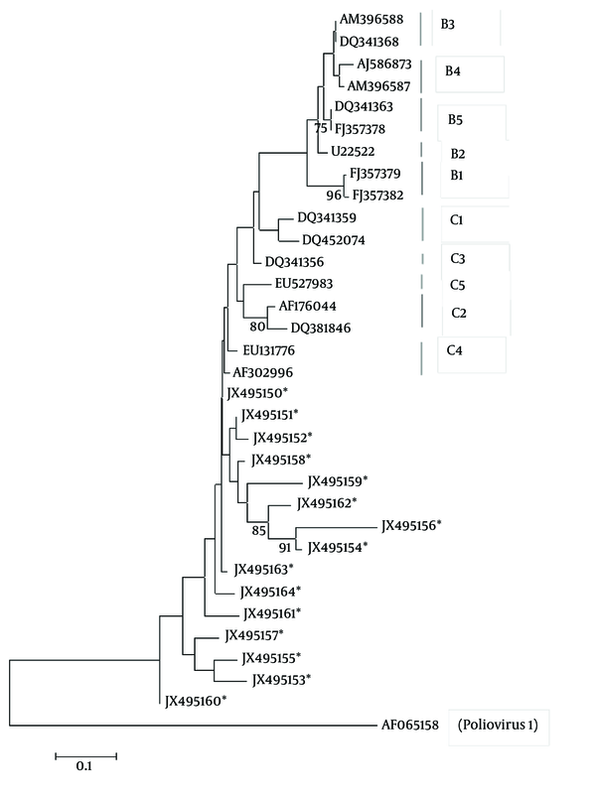 According to the phylogenetic tree analysis, these 15 isolates from the C genotype are related more to the C4 sub-genotype than to the other C sub-genotypes. However, further studies to identify the full-length sequence of VP1 and/or VP4 from Iranian isolates and comparison with other isolates are required. Unfortunately, we could not gain access to patients with HFMD, in order to assess their specimens in the present study, because most of these individuals were out-patients. No data regarding the frequency of EV71 and its circulating genotype(s) are available in Iran; therefore we had nothing with which to compare our findings. In accordance with other studies of EVs in aseptic meningitis in Iran, the present study revealed that, although there were no fatal neurological complications, EV71 infection should be considered as one of the major causes of the disease, especially in very young children in Iran. We wish to thank professor Qibin Leng (key laboratory of molecular virology and immunology, institute Pasteur of Shanghai, Shanghai institutes for biological sciences, Chinese academy of sciences, Shanghai 200031, China) for his material support and for providing us with the positive control of EV71. We also wish to thank Dr. K. Azadmanesh for his general support of this study and the staff of the department of virology, Pasteur institute of Iran. Authors’ Contribution: Study concept and design: Pooneh Rahimi; acquisition of data: Akram Rouhandeh and Amir Sohrabi; analysis and interpretation of data: Pooneh Rahimi, Ehsan Mostafavi, and Golnaz Bahram Ali; drafting of the manuscript: Pooneh Rahimi; critical revision of the manuscript for important intellectual content: Pooneh Rahimi; Administrative, technical, and material support: Pooneh Rahimi; study supervision: Pooneh Rahimi. Funding/Support: This project was financially supported by the Pasteur institute of Iran under project number 567.